Many cats are kept indoors for various reasons, but because they’re natural foragers this can lead to a host of behavioral and health problems. New research shows that food puzzles are effective at staving off many of these problems. Cats aren’t too far removed from their evolutionary ancestor, the African wildcat, making indoor life a serious challenge. Indoor housing has been linked to an assortment of health problems, including chronic lower urinary tract issues, obesity, diabetes, and troublesome behaviors such as aggression, house-soiling, and attention seeking. 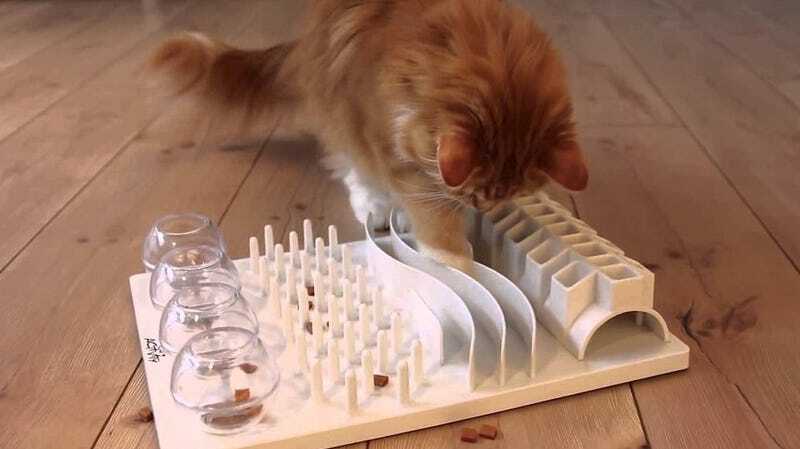 In a new study published in the Journal of Feline Medicine and Surgery, a research team from the University of California at Berkeley tout the benefits of food puzzles—gadgets that force cats to work for their food. These puzzles take advantage of the feline hunting instinct, fulfilling their ingrained desires. By “foraging” for food in this way, cats are more physically active, they experience reduced levels of stress, and they become less demanding of their owners. A number of food puzzles are currently available on the market. Some require cats to push or roll a mobile device with their nose (like a plastic ball with holes in it) , while others are stationary, requiring cats to navigate a board. Typically, these puzzles can be used with either wet or dry food. And as the authors note, these puzzles can be made easily at home, for instance, by cutting holes in egg cartons or water bottles. Even a brown paper bag will do (there are some good DIY tips here). In the new study, the researchers describe over 30 cases from their own practice in which these puzzles were shown to help with a specific health or behavioral concern. In one example, an obese eight-year-old domestic shorthair cat lost 20 percent of its body weight within a year of puzzle implementation. Other examples included a three-year-old cat whose impulsive and frustration-based aggression was resolved within six months, and a two-year-old cat whose fear of people was alleviated following the introduction of both mobile and stationary puzzles. The authors point out that cats have their own individual preferences when it comes to food puzzles, so it’s important for owners to choose the right one. It can be a trial-and-error process, but ultimately the end goal is to provide several different types of puzzles to keep them engaged. At first, cats may struggle to get the food out, so the researchers suggest overflowing the puzzle with food in the beginning. As they become more proficient, the quantity can be decreased. Food puzzles are good for multi-cat households, but the researchers suggest that each cat should have their own toy. As for fido, it’s best to separate the cats and their toys from the household dog.